Galvin Property is proud to present No 29 Churchfields to the market. A beautifully presented 4 bedroom family home of the highest calibre in a popular, well established and mature development close to Milltown Village. This attractive, semi detached red brick comes to the market in very good condition with the benefit of a south facing rear garden, a cobble locked driveway and a view of landscaped gardens directly opposite. 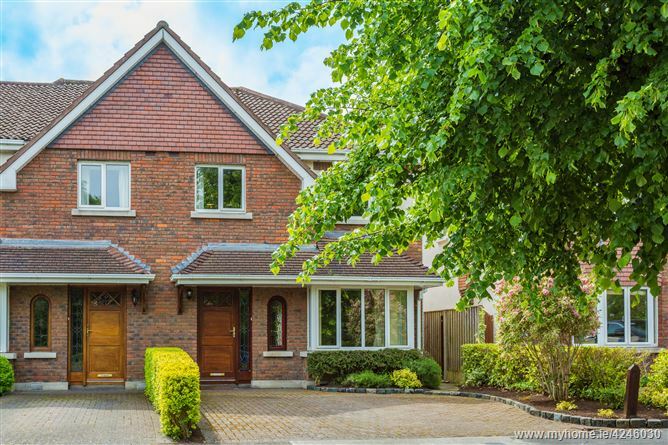 Those hoping to put down roots in a family friendly area close Milltown Village, Dundrum shoppping Centre with the LUAS passing nearby should look no further. The property extends to 1,200 sqft (111.5sqm) of well appointed accommodation. Downstairs the open plan kitchen / dining room over looks the rear garden and enjoys a sunny southerly aspect. Double doors lead from the dining room to the living room at the front of the house with a gas fire with marble surround and a box bay window. Upstairs there are four bedroom rooms (one en suite) and the main bathroom. *The fourth bedroom is currently in use as a walk in wardrobe for the master room but could very easily be converted back to a bedroom. The location simply couldn't be better. Tucked away in a quiet development close to the bustling village of Milltown, the Green LUAS line stop is a mere ten minute walk (800m). From there the City centre or Dundrum Shopping Centre are just minutes away. There are an array of excellent schools in the area including Alexandra College and Gonzaga with UCD also nearby and Trinity within striking distance. Milltown and the surrounding areas are extremely popular due the the wealth of amenities available including public parks, golf clubs, fitness centres and sports facilities. All within easy reach of the City Centre.